We haven't sent news for quite a while and it's time for an update! We value your support as a member and look forward to your input in many ways: by active participation on the site, through the donations which many of you send us, by comments and advice you communicate to us and by your attendance at many of the events held at Todmorden each year. Thank you! Finishing the Wetland Enhancement Project in 2000 gave us a bit of a break, but we have been using that time to do maintenance to make sure the plants survive, and to clear a new area for planting. We have forged some new partnerships and we are starting to plan some exciting new projects that we hope you will support. This newsletter outlines some of the great volunteer opportunities at the Wildflower Preserve over the next three years related to the new projects. Now is a good time to get involved because it's the beginning of the process. What a beautiful site the Wildflower Preserve is -- so near to home, easily accessible and when you are there you forget you are in a busy urban area. Have a look at the list of projects. Can you join us? We are excited to announce that the Ontario Trillium Foundation has approved a grant to us for $64,700 over the next 3 years. This was the full amount that we requested, and represents about one-third of the total budget for the new programme that we have designed. The remaining costs are being shared among partners, sponsors and include in-kind donations of time and services from volunteers. The grant will help us to continue to restore Todmorden to a vibrant natural environment which enhances the health of the local community and provides rich recreational and educational opportunities for all local citizens. Detailed plant inventory and creation of a wildlife monitoring scheme. Development of a 10-year management plan for the Preserve. An additional 3 ha of forest restored by plantings, clean-ups and exotic weed control. Newsletters, a brochure and interpretive trail guides distributed to 1,000 visitors annually. Membership increased to 75 members, and volunteer participation increased to 500 volunteers annually. Copies of our proposal are available on request. Our proposal would not have successful without the commitment and help from some key partners and people in the community, notably Garth Armour and Beth McEwen, City of Toronto; Jim Hawtin, Toronto East Rotary Club; Rita Russell, Todmorden Mills Museum and Arts Centre; Stephen Smith, UFORA Inc.; Dr. Mark Taylor, Beak International Inc.; and Steven Peck, Past-President of Friends of the Don East. Saturday, April 5, 10 am. Annual spring garbage clean-up. With Friends of the Don East. Sunday, May 25, 1:30 pm. Spring wildflower nature tour. James Kamstra James Kamstra is a biologist and environmental consultant with extensive experience conducting biophysical inventories and environmental impact assessments. 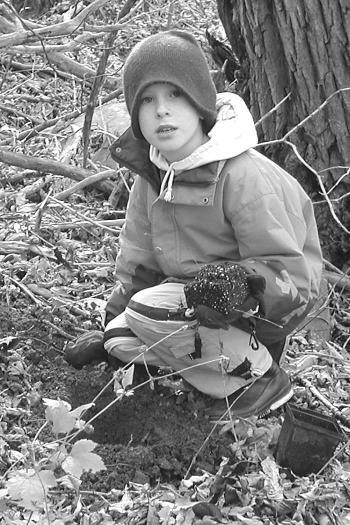 I have been conducting a biophysical inventory study of the Todmorden Mills Park site for the Todmorden Mills Wildflower Preserve over the growing season of 2002. The purpose of this study is to document existing vegetation conditions and the biophysical environment that is influencing it. A report will be completed that will form the environmental baseline for a future management plan of the property. Field investigations were conducted on April 26, May 10, May 28, June 13, July 2, August 7 and September 9, 2002. Aerial photographs (flown in 1998) were acquired and interpreted to understand the terrain conditions and delineate vegetation communities. During site visits the vegetation was described following the standards of the Ecological Land Classification system: dominant species, structure, size, vegetation layers and terrain. Soil profiles were examined using a soil auger. All species of vascular plants were documented, and incidental notes on any wildlife species were made. The total list of vascular plant species recorded is over 200. Many of these are non-native species, including several problematic invasives such as Garlic Mustard, Dog-strangling Vine and Common Reed. There are a number of species regarded as rare in Toronto by Varga et al. (2000). Most of these were planted on site by TMWP, and I have plant lists to help me determine what was originally on site and what has been added. This summary describes some of my preliminary observations to date. 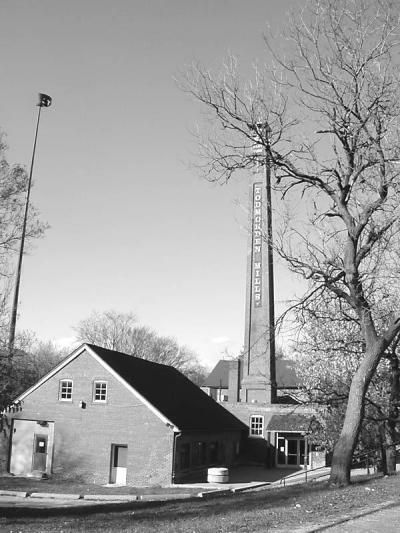 The data needs to be mapped, compiled and analyzed to better understand the existing biophysical features and functions of Todmorden Mills Park. This will be completed in the coming months. Editor's Note: This article is an excerpt from the preliminary report which James Kamstra submitted to the Board. One of the ways that we are restoring the parkland at Todmorden is by planting existing areas with native species. This year 2,148 trees, shrubs and wildflowers were planted by a total of 150 members and volunteers over four days in spring and early fall. A young volunteer plants Jack-in-the-Pulpit in the fall. In April, we had students from University of Toronto School and from Chester School plant trees and shrubs in a newly-cleared area at the back of the site. This planting was sponsored by the Toronto East Rotary Club, with special help from Jim Hawtin who chairs the Ecosystem Education committee. The site had been prepared in the winter of 2001 by Steve Smith of Urban Forest Associates Inc. with help from volunteers. On September 28, about 20 staff and family members from American Express helped plant 1,472 plants around the pond and in the floodplain swamp. This is the second year that AMEX employees have generously given up part of their weekend to help the Preserve. Thanks go to Head Office staff member Tina Princiotto for coordinating this event. Garbage on the site continues to be a challenge. It blows in off the Don Valley Parkway on the western edge of the site. It appears mysteriously in the parking lot periodically. On April 6th about 50 volunteers and members combed the Preserve and Museum grounds collecting garbage. What a success! We estimated that over 2 tonnes of garbage was accumulated by midday. Participants were then treated to a hot dog lunch provided by Friends of the Don East, our partner in this annual event. The focus of our work at the Preserve is environmental -- we strive to restore the natural habitats in this special place. The work is done by people and there are many to thank. Here are some who helped this year (please let us know if we forgot someone). Friends of the Don East (FODE) board and members who joined us for the spring clean-up at Todmorden. Rita Russell (Acting Curator), Todmorden Mills Heritage Museum and Arts Centre, and her staff for helping with events. Colleen Prentice, former board member, who has moved to Nova Scotia where we wish her all the best. Thank you for your help. Stephen Smith, UFORA Inc., for coordinating the planting events, and preparing the sites for planting. School children from Chester Hill and their teachers, for their participation in the Rotary planting in April. Jim Hawtin, Chair of the Rotary Club's Ecosystem Education program, for his continuing support of our work at Todmorden. Garth Armour and Keri McMahon, Toronto City Parks and Recreation, for in-kind donation of native plants for our fall plantings. Glenn Gillespie and Paula Davies for dropping everything one Saturday in spring and fixing the Pond viewing stand which had been vandalized. Leaside Garden Society and Marilyn Smith for recent donations to the Preserve.